We achieved a major milestone today with the completion of the first phase of the Kitely Market! Merchants can now create their stores, and we are offering a limited time promotion which can save you money and increase your sales with free advertising. We also made two changes to our support infrastructure. First, we moved the forums to a new URL: https://www.kitely.com/forums/. Second, we created a documentation site at https://kitely.atlassian.net. Currently this site is focused on information about the Kitely Market, but in the future we’ll add other types of information as well. Kitely Market is now open to merchants! Content creators are invited to create a store and add products to it. The market is not open to buyers yet, but we are now working on this functionality, and we expect to have it ready this summer. The rest of this blog post explains how to use Kitely Market as a merchant. Enter Kitely Market by clicking on the Market button in the toolbar. Once the market is open to buyers this page will allow users to search the market. However, right now this page only allows you to create a store. Click Create store, enter your store’s name and description, and click Create. This will bring you to the Store Home page. The Store Home page lets you manage your store. Here you can change your store’s Name, About, and pictures. The banner picture will appear when users view your store’s products. The thumbnail picture may be used when searching for stores. Click Manage products to add or edit products. This page shows all of the products that you have in your store. Click Add Product to create a new product. This pops up a window with your avatar’s inventory. 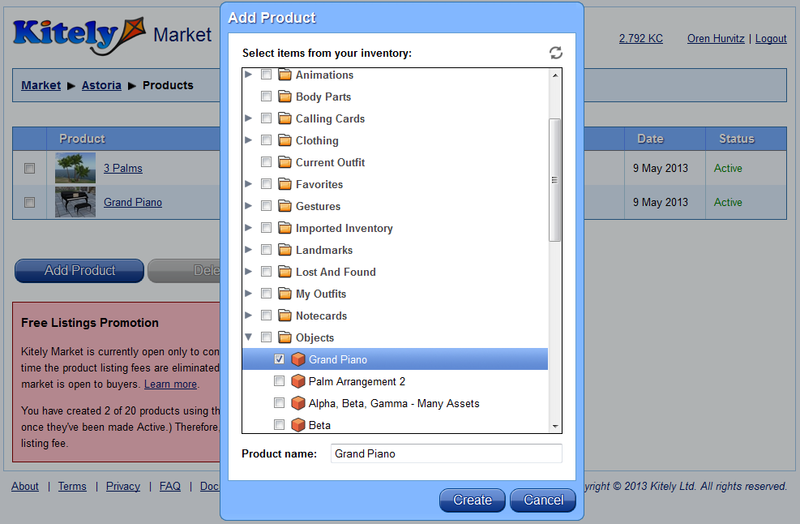 Click on the checkbox next to the items that you want to include in the product, and then click Create. You must have Copy and Transfer permissions on all the items that you add to the product. After you’ve created a product (or clicked on an existing product) you will enter the Edit Product page. In this page you can view a product’s details and modify the product. We have a description of all of these fields in the Kitely Market documentation page. In addition, we’ve created guidelines for creating good product listings. We’ll now describe briefly the parts of the Edit Product page. The first part of the Edit Product page lets you set the general properties of the product, such as its name and category. The next part of the page lets you add variations, and set properties that apply only to the current variation such as price and permissions. In this example the product has only one variation. Next, you can set the product’s attributes. 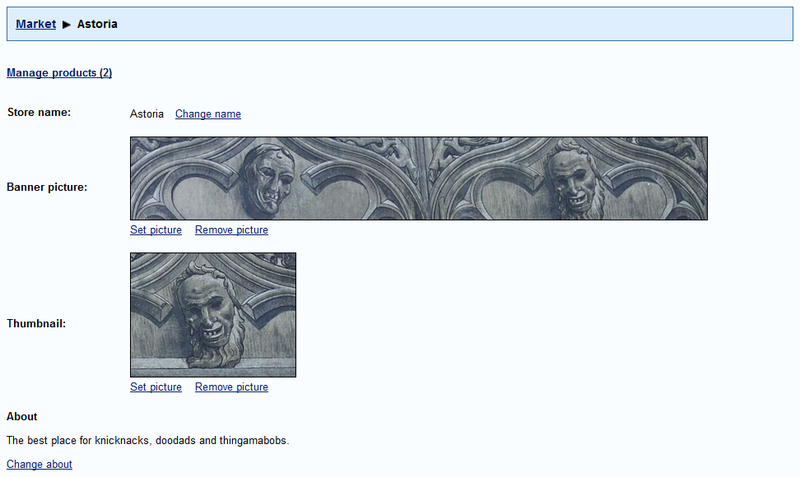 Attributes are used by users to refine their searches. You can choose which attributes apply to the entire product (on the left side), and which attributes have different values in each variation (on the right side). Finally, the page shows all of the items in the currently viewed product variation, and you can set the product’s description. If you want to modify a product then visit the Edit Product page and start making changes. These changes don’t affect the product in the market until you click Accept changes. Or, if you change your mind, click Cancel changes to revert the product to the last accepted state. Notice that there’s no “Save” button in this page: every change you make is saved immediately and automatically, but it won’t be seen in the market until you click Accept changes. This concludes our overview of how to use Kitely Market. Normally there’s a fee of 100 KC to add a product to the Kitely Market, and 25 KC to add a variation. However, we are offering a limited-time promotion to encourage merchants to add products now, so that they’ll be ready once the Kitely Market opens for buyers (Update October 5, 2013: Kitely Market listing fees have been eliminated). Add 20 products to your store for FREE (no listing fees). If your first 20 product listings adhere to our guidelines then you may request to be allowed to add an unlimited number of products to your store for free. The link that allows sending this request appears once you have added 20 products to your store. If you create at least 100 product listings that adhere to our guidelines then you’ll be considered for Featured Merchant status. Featured Merchants will be featured for free on the Kitely Market homepage, and they’ll get free in-world shops in the official Kitely Plaza. The free listings promotion will expire once the market is open to buyers. However, Featured Merchant benefits will last for an entire year after the market opens for business. See the Kitely Market Fees page for a complete list of fees, and additional details about this promotion. Please note that there are no fees for uploading content in Kitely: only for listing products. Furthermore, if you don’t have a world of your own where you can create your products then you can use the free Kitely Merchants Sandbox. You can optionally enable the Export permission on your products. When this permission is enabled, users are allowed to take the item out of the Kitely grid. Initially this means that when users export their world to an OpenSim Archive (OAR) file, the item will be included in the OAR. Later we will allow Exportable items to be transferred to other grids as well. In the Add Product dialog, when you click on a folder only the folder is shown as selected, but not the items inside the folder. However, these items are included, as you can see once you click on Create. If you try to Accept changes in a product that has some missing fields then you’ll get an error message. This message doesn’t specify which of the product’s variations has the missing fields; it might not be the variation that you are currently viewing. If you encounter any other problems then please let us know in the Kitely Market forum.